We visited my parents at the end of April. It was a great trip, complete with a night away in a hotel room for Hubby and me, in celebration of our five year wedding anniversary. The night away was great. We had dinner at a nice restaurant and I got to eat it while it was hot and without telling anyone to stop blowing raspberries at the dinner table. We walked out to a tiki bar near our hotel and had yummy adult beverages and talked. I slept through the night. 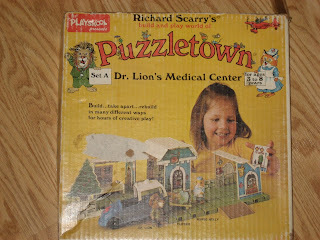 That is a photo of Pumpkin playing with one of my favorite toys from childhood, Richard Scarry's Puzzletown. 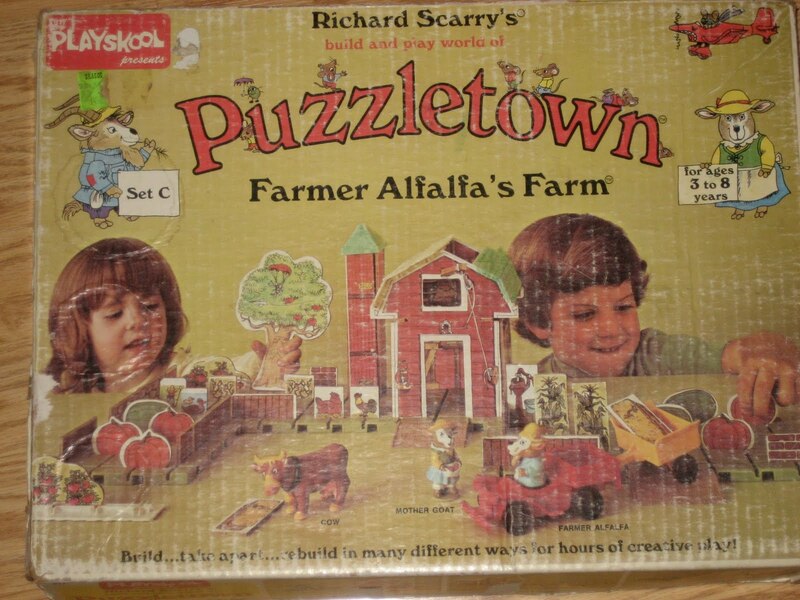 It is a green plastic grid with sturdy cardboard shapes that you stickin the grooves to build scenes. There are also plastic characters to place in your scenes. I saved my own money to buy them when I was a kid, and I still remember how disappointed I was the day I went back to buy another set, only to find that the store no longer carried them. Still, I played with the two sets I had for years. After I outgrew them, my Mom kept them for visiting children and she also took them in to her first grade classroom. It is amazing how well those cardboard pieces have held up. As we were driving home at the end of our visit, Pumpkin wanted to know if we had the Richard Scarry toys at home. I had to tell her no. I'd buy them for her if they still made them, but they do not, and I can't justify purchasing used sets on eBay- the listings I found had asking prices of about $90. So those toys will stay a treat to be enjoyed on visits to Mimi and Boppa's house. I'm so glad that my parents kept them for all of these years! What toys do you remember playing with when you were a kid? Are they still available? My son has my Fisher Price Farm from when I was a kid. He also has my husband's Robotech toys (Rick Hunter's plane and 2 Invids). Plus a Transformer. 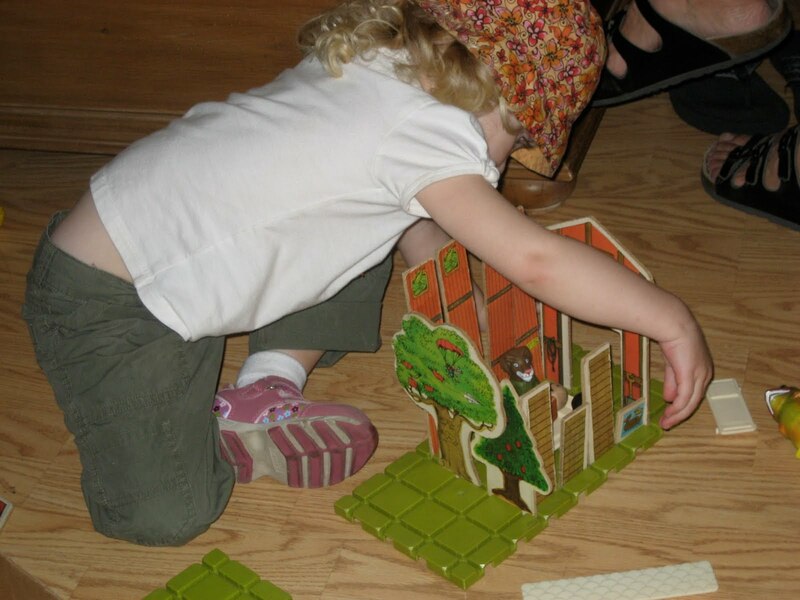 When we go to my inlaws, they have a Fisher-Price house, a houseboat, and lots of Little People (the old-school kind). Oh, and half a ton of Legos. DS has an awesome set of big fisher price trucks/diggers/cranes etc. that he recived from his "Papa" (paternal grandfather). 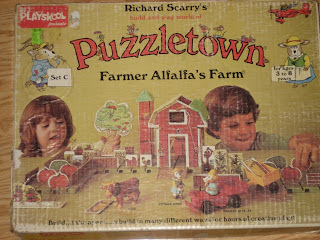 They were my husband's toys back in the 70s. They are in PERFECT condition. It makes me a little teary when I think about Papa holding onto those toys all these years (through, about 12 moves and three marriages) in case my husband had kids. I had such a deep love of Barbies and everything Barbie. My mom saved many of my favorite dolls, clothes and toys, which she gave back to me recently. I hope to bring them out for special play, just like my mom did with her Ginny dolls when I was little. I was in Target yesterday and saw that a lot of old toys are being re-made and re-issued, not updated but to look like they did back then. Let me see if I can find a link... can't find a good example. But they were Fisher Price. So maybe the Richard Scarry games will be reissued too! Who made them? Big question though: will the reissues be anywhere as sturdy?